Posted on Monday, January 20th, 2014 at 8:24 pm. Controversy abounds the proposed rematch between newly crowned WBC featherweight champion Jhonny Gonzalez and three-time divisional belt holder Abner Mares. After Gonzalez shocked the boxing world with a first round knockout of the fast rising Mares last August, Mares proved to be the warrior everybody knew he was by asking for an immediate rematch. Despite Gonzalez attempting to hold off for a purse he felt was equal to his now championship status, he finally relented for February 15th at the Staples Center in Los Angeles, CA. When everything seemed as it was going on schedule for the first truly anticipated match up of 2014, Mares surprisingly announced some weeks ago that he had suffered a minor rib injury and would have to pull out of the proposed fight date. From then on, a number of stories have erupted regarding the alleged true reasons for Mares’ side step and the seriousness of his injury. Most of the allegations have come from Promociones del Pueblo, Gonzalez original promoter, although Jhonny does owe Golden Boy Promotions three fights since signing an option contract with De La Hoya’s company for the right to face Mares the first time. Oswaldo Kuchle, who along with his father Reginaldo lead Promociones del Pueblo, has stated publicly that he despite promises from Golden Boy, has not received any medical proof that Mares is indeed hurt or if actually is, how severe is the injury. He went on to say that he felt that Golden Boy needed a bit more time to sell tickets for the event and that is why they concocted the story of the injury. Golden Boy did produce a medical report that stated that no fracture was evident but that there was some bruising on the left lower rib area and was advised to not only rest but to avoid any strain. It was rumored that the Gonzalez-Mares return bout would be the co-main event for the March 8th PPV main event between Saul “Canelo” Alvarez vs Alfredo “Perro” Angulo in Las Vegas but that story was soon refuted when it was announced that Mares would not be available until possibly the summer. Gonzalez’s camp stated that if it was May, they were willing to wait despite not allowed to make a voluntary defense by Golden Boy last December. The news quickly filtered that Mares wouldn’t be ready any time before June despite no actual date given. Eric Gomez, head matchmaker of Golden Boy Promotions, offered Gonzalez a return title fight before the Mares rematch against undefeated Gary Russell Jr but Kuchle refused the idea since Russell Jr is a southpaw. 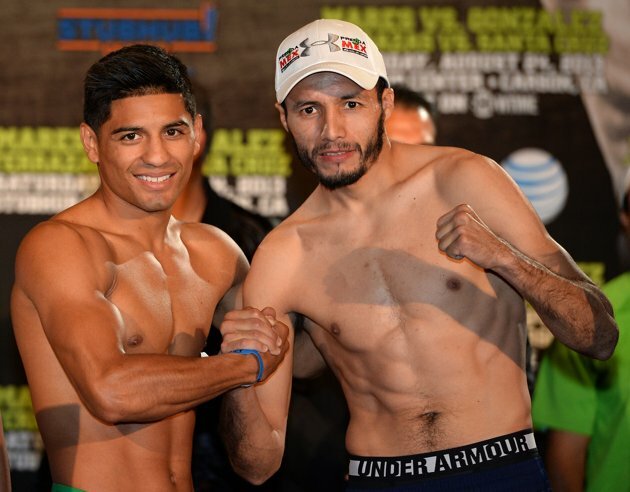 Kuchle did mention in a recent interview that he was willing to have Gonzalez face any other featherweight under the Golden Boy Promotions banner mentioning the likes of Ronny Rio among others but that was not on table according to Gomez. A Russell Jr win over Gonzalez would put the WBC title once again under the power of Golden Boy Promotions. Russell Jr, one of the few Al Haymon fighters not signed to Golden Boy, could be considered a better opponent for Mares to regain his past glory. Despite quick hands, great boxing skills and a southpaw stance, he still could be considered a much easier opponent than the rugged, hard hitting and lanky Gonzalez who already proved that he has what it takes to stop Mares. No surprise why the Gonzalez brain trust said no to Russell Jr, it was a part of the master plan.